In June 1982 1 received an invitation to have a short holiday in Holland, from a Dutch friend whom I had met whilst youth hostelling in England the previous year (you can still go hostelling at 33, especially on a Honda! 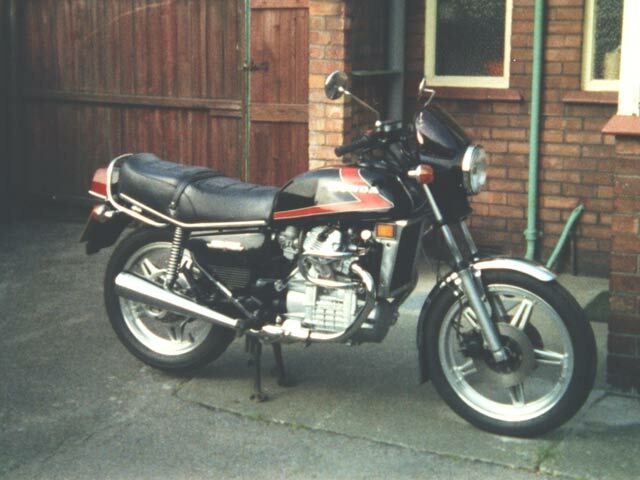 A quick check over the bike (a January 1981 CX500A, which I bought new) revealed the need for another new Metzeler on the rear, everything else was ok as I had done the 18000 mile service only a week or so earlier. During the following week I obtained tickets, a green card and some money. A trip to Smart’s Tyres in Liverpool (only 20 miles from home), who gave excellent service, sorted out the tyre and I was almost ready. On the Saturday I wheeled out the well laden CX from the garage and warmed up the 10/40 Valvoline for a minute or so and then set off through Ormskirk and out onto the M6. The bike soon settled down to its favourite mid sixties speed whilst I waited for the Stoke turn off. Once I’d left the motorway I really felt on holiday, it was turning out to be a beautiful day as I followed the signs around Derby, Nottingham and out towards the Wash. The lure of the Little Chef sign proved too great as I joined the A17 towards Kings Lynn, so I stopped for lunch and fuel. Resuming the lovely ride through Lincolnshire and into Norfolk, I arrived as arranged, in Norwich for a short rest and a meal with my friends Derek and Maureen Waller. In the early evening I set off again through the Norfolk and Suffolk countryside and marvelled at the work of the Thatcher (no - not that one!) the pink wall painter and the lesser known pot hole mender and arrived at the Parkestone Quay in Harwich just as boarding had started. Directed to the sharp end of the ship by a very friendly Dutch chap, I set about removing my gear and tying the bike down. After locking the panniers and top box and removing the tank bag, I went in search of the very comfortable lounge, having decided against a cabin on this trip, as I don’t get much sleep afloat anyway. After a freshening wash and a good breakfast the following morning, I wandered down to reload the bike and met a middle-aged Dutch couple who had spent• some weeks touring Scotland by bicycle - they looked as fit as butcher’s dogs! - and still had quite a distance to do in Holland before they reached home. Off the ship, through customs, passport control and away east towards Delft, Gouda and Utrecht. I had arranged with Josee to be in Leeuwarden (Friesland) at around 5pm so I had all day to ride a leisurely 200km or so, which made me take a detour through Arnhem, Apeldoorn and Zwolle. This latter place being where I was tempted by the now familiar knife and fork sign for lunch. The meal and service were excellent and the people extremely friendly. Returning to the bike I found two policemen in white jackets crouching next to it. One of them was pointing to the radiator, thankfully only out of interest (there weren’t so many water cooled bikes back then). After a brief chat they climbed into their Porsche 91 IT, donned their crash helmets and sped away. The bike was really at its best in these warm dry conditions and although well laden, still managed 200 miles on the trip recorder before I had to switch to reserve, which I knew from past experience was a shade under 70 mpg. As I made my way towards Assen there were droves of big bikers coming the other way, headlights blazing and Day-Glo suits on! and each giving the customary wave (my arm really ached with replying) They were all leaving the TT gathering - I wished I had been a day earlier - maybe next year. I pressed on and arrived in the beautiful old university town of Groningen to pay a surprise visit to some people I had met on the previous trip and also to deliver a Sam Browne reflective belt which they don’t apparently have over there. Edo rides a new CB900F2 Bol Dor and his wife, Fin, a 750 V twin Yamaha! The CX was still purring along as I made my way down the old but well surfaced road to Leeuwarden, arriving just after 5 o’clock. The following week was spent touring the area on the bike, two up now, as I had taken a spare helmet and intercom in the top box. We visited as many of those delightful Dutch villages as possible and also managed a trip over the big dike which encloses the former Zuider See (now called the Ijsselmeer) to the coast at Zandvoort to watch the practice for the Dutch Grand Prix. An early evening trip around the unspoilt villages of Marken, Volendam and Edam had us well on our way back up to the North and Leeuwarden again. Incidentally did you know that Edam, famous for its cheese, is exactly 20,000 miles from Southport Motorcycle centre?, and by the route which I used took me almost 18 months!! We had a little more time the following week to explore the area around the coast of Friesland and for a trip to Almeland, one of the many small Friesian islands, it was certainly an advantage having your own local guide riding pillion, except when she lapsed into rapid Dutch when a farmer completely blocked the road with his tractor and trailer until his dog caught up with him!! On the Wednesday I had to bid farewell and set off in the general direction of home. I chose a route which took me south through Meppel to an excellent bike dealer in Staphorst (Gebben) where I saw my first GL500 SilverWing in silver, I’d love one of those one day. My next goal was to visit the Lips Autotron motor museum in Drunen before my steady ride back to the Hook for the night crossing. Leaving Harwich the following morning, I headed out across country, stopping only for lunch and fuel to arrive in South Wales in the afternoon where I was to attend my cousin’s wedding the following day. There was acute panic on the morning of the wedding, as my suit arrived only an hour before the ceremony, having been delivered by a friend of my cousin! Later that day I restarted the CX and made my way back to Southport having covered over 2300 miles at an average of more than 67 mpg for the whole trip and used no oil or water. I know this is Honda trumpet blowing, but my bike has now done 26000 miles (always on Valvoline oil) and apart from tyres has only had a new rev counter cable and a rear brake light switch. This shot was taken on the day I sold it - 3 years old - 35000 miles, and all back to standard! Lots of things have changed in nearly twenty years since I wrote this piece as a competition entry for ‘Hondaway’ a magazine which was dedicated to all Honda products. The CX went on to cover over 35,000 miles before I changed it for a VF75OS. I got married and Christine and I still visit Josee in Leeuwarden, but now on a 1500 Wing. Smart’s Tyres were taken over by Kwik Fit and now no longer supply motorcycle tyres. Southport Motorcycle Centre is now Southport Superbikes and no longer sells Hondas. Petrol has gone from under a quid to almost four for a gallon and that particular Little Chef in Lincolnshire has now long gone - such is life!